We spent most of yesterday at Eureka Park over at the Venetian checking out the start-ups. There was some great tech and some pretty lame stuff. Then it was over to LVCC for the connected cars – they park themselves – it’s pretty darn cool – and then back to LVCC for a meeting with Misfit Wearables to talk about the Shine. Then we caught up with Larry Downes and Paul Nunes (authors of the awesome new book Big Bang Disruption) for a delicious dinner at China Poblano over at the Cosmopolitan. Then Tom and I headed back to the Venetian for Lenovo’s amazing social media night party at Aquanox. We got to play with all the pcs and tablets and phones. Fun! Good party – thanks for inviting us! Heading back to DC today so I’ll post more this weekend about the new tech after I get organized for my classes. First day of class at #gwbusiness is Monday! Playing at the booth, I got lost in the game play and got seriously spooked. Tom’s Vine was there! We spent most of the day in South Hall, visiting booths for smart home, sensors, wearables, 3D printing, drones and smart objects. Belkin’s wemo exhibit was impressive – they seem the farthest along in offering a well organized set of connected devices for home applications. Word is Lowe’s and Staples have impressive set-ups so we’ll check those out tomorrow. The Parrot drones were delightful – one type is like a cute little bug and the other is like a futuristic little plane. I bet these become wildly popular. The most interesting development had to be represented by the 3D printing tech zone. Two years ago, 3D was a few booths hidden in the back and Maker Bot’s printer looked pretty bootleg, and was glitchy, to boot. Fast forward a mere two years and there are too many manufacturers and related suppliers to count and Maker Bot is now the slick grand daddy. Plus, the tech works and it’s now affordable for the home market. Great ready for 3D printed everything. I shot the picture below at the beam exhibit – they have a really interesting product for telecommuters. Fans of the Good Wife will recognize it from one of the episodes. 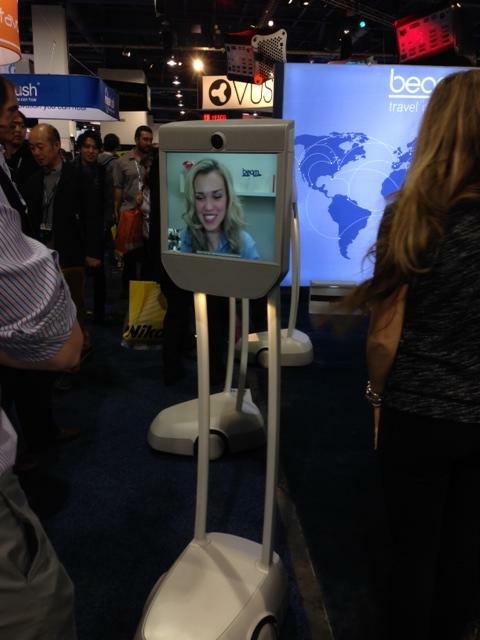 Through the device, I had a nice conversation with a beam staffer in Palo Alto – the tech really works! The wearables were pretty much what you’d expect. Dozens and dozens of smart watches, some pretty nice and others pretty ugly. I kept thinking, where are you, Apple iWatch? The fitness and digital health wearables are impressive, especially when the tech is paired in the context of a larger ecosystem – like a hospital room. At the Piston console booth I had fun playing with the Oculus Rift headset until I got shot or zapped in the game and it really freaked me out. See my Facebook page for Tom’s Vine of the episode. The Zigbee home automation booth had an interesting prototype hub about 6-12 months away. The challenge is to deliver simplicity and ease of use to the mass consumer market. At the Intel keynote, I LOVED the smart charging Bowl – throw all your devices in the bowl and it charges them. No plugs! Totally cool. Plus, the Smart Earbuds are a great idea. CEO Brian Krzanich did a great job showcasing Intel’s play in the Internet of Things. The smart onesie that quantifies baby’s vitals – powered by "Edison" a pentium computer the size of a thumb! – is perfect for helicopter parents.